Inside, you will find a short history of the Chenango County Sheriff's office, Photos from the past and interesting facts. We are always looking for more photos and stories. If you have any to share please contact Lt. Chris Miles at 607-337-1971. Based on research by Doris W. Waters, Deputy Sheriff in 1962. The first jail was in the Courthouse, as also the jailor's apartments. Both buildings were made of wood and the jail building as stated by a local historian was insecure and desperate felons often effected a General Delivery. Fire, artfully supplied, generally secured an escape. Sometimes the flames would rage beyond control, endangering the lives of the incendiary and jeopardizing the edifice itself. To afford greater security, the legislature in 1830, authorized the supervisors to levy and collect by tax $2,000.00 for the construction of a stone building for the custody of prisoners. The present Courthouse is the fruit of that action, taking the place of the old wooden structure in 1837, at a cost of $16,000.00. Construction of the building was in the charge of a commission appointed by the Governor. Charles York, Henry Stone and Thompson Mead were the commission members. The Norwich Supervisors meeting of December 6,1901, heard the report of a committee. George L. Page of Greene and Blinn Buel of North Norwich, appointed in 1900, on the condition of the jail. They reported that, in view of the repeated condemnations of the present jail buildings and facilities by Grand Juries of the County for many years and the equally strong censure of the State Prison Commission for permitting their continuance in their present condition, we recommend that proper and requisite steps be taken by the board to accomplish the building of a new Jail and Sheriff's residence. Upon acceptance of this report the committee was discharged and a motion adopted that a committee of three, of which the chairman be appointed one of them, take charge of the matter. Supervisors Page of Greene and Nash of Norwich were appointed to act with the chairman. 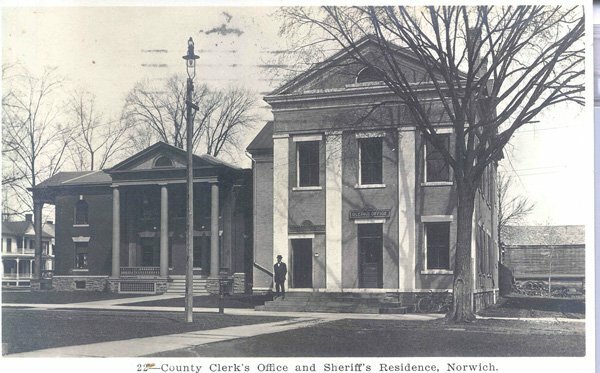 Norwich, April 4, 1902 - At a special meeting of the Board of Supervisors held last week, it was unanimously voted to build a new jail and Sheriff's residence in Norwich this season. The plans submitted by Architect W.J. Beardsley of Poughkeepsie, were chosen and have been endorsed by the State Prison Commission. The cost of the new building, including the architect's fees and $3000.00 for the property of Lucy Jennison is estimated at about $31,500.00. In order to provide the extras, the sum of $35,000.00 will be raised by means of bonds of $500.00 each. Ten of the bonds will become due each year, beginning February 1, 1903. The rate of interest on the bonds was fixed at 3 1/2 %. They will probably be sold at auction. A committee was appointed as follows: Messers, Butterfield, Page, Beardsley, Nash and Miner. They will have charge of the matter and take the necessary steps to acquire the additional land needed, etc. It is expected the work will begin early next month. At an auction, the old jail buildings were sold to the highest bidder. The barn went to Art Aldrich of 57 West Main St. It was taken down and reconstructed at the rear of his lot. The jail kitchen and sheriff's residence were sold to R.E. Rindge to be rebuilt for the A.M.E. Zion Church on Fair St. for a parsonage. The Lucy Jennison property, which was located where the present Sheriff's Office is located, was purchased by the county for $3,000.00. 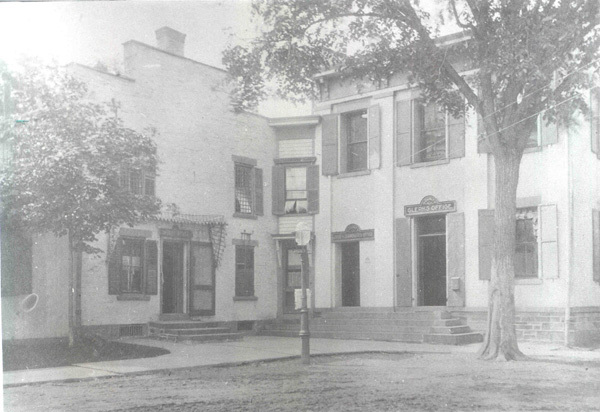 The house was sold to Virgil Scott, who moved it to the old fair street school lot, which he owned and where he had a glove factory in the former school building. Chenango Union, May 23, 1903 - The new Chenango County Jail is completed and occupied. J.J. Flanagan, Sheriff.